As he had gained 21 percent of the popular vote but only eight percent of delegates, he afterwards complained that he had been handicapped by party rules. 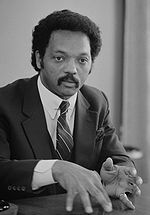 While Mondale (in the words of his aides) was determined to establish a precedent with his vice presidential candidate by picking a woman or visible minority, Jackson criticized the screening process as a "p.r. parade of personalities". He also mocked Mondale, saying that Hubert Humphrey was the "last significant politician out of the St. Paul–Minneapolis" area. reprioritizing the War on Drugs to focus less on mandatory minimum sentences for drug users (which he views as racially biased) and more on harsher punishments for money-laundering bankers and others who are part of the "supply" end of "supply and demand"
He campaigned again in 1988 when he more than doubled his results. Faw, Bob; Skelton, Nancy (1986). Thunder in America: the improbable presidential campaign of Jesse Jackson. Austin, Texas: Texas Monthly Press. OCLC 727946029.